I walk barefoot in my orchard, feeling the grass blades tickling my ankles, with a light summer dress and a wicker basket in my hands. I walk under shadowy trees, whose branches are heavy with ripe fruits. Bees are buzzing with a dull sound, busy collecting precious golden nectar. I cram my basket with velvety peaches and sweet crimson plums. Later in the season there will be apples and pears. Cherries are already a fading memory, lining up on the shelves in shining jars, covered in syrup. This is one of my recurrent dreams, and I am perfectly aware I’m working with my fantasy, as I would not walk barefoot in a field at summer, where there would be more sharp and dry weeds and sticky fallen fruits than fresh grass. Knowing myself, I’d probably wear comfy trousers and a faded t-shirt, with a Pollock-style pattern of tomato sauce and olive oil. I have this dream of an organic orchard, and we just put the foundation of that dream. We bought from a nursery a dozen very young trees, all belonging to ancient local varieties. They will live side by side with our pre-existent yellow plum and apricot trees. There are two hazelnut trees, a walnut tree, two yellow peach trees and a pesco cotogno, a tree that will produce baby pears in summer and one which will give us rusty pears in autumn, two cherry trees and two apple trees, one of them producing mele Francesca, tiny green apples which I just discovered are my favourite apples for baking. We worked for the whole morning, like busy hard-working ants, dig here, cover with pebbles and stones there, move that tree, play with Noa and enjoy the sun for a moment… After a few hours tiny skinny twigs were lined among the olive trees. It will take years, but we proudly laid the foundation of our dream orchard. Now raspberries, red currants and gooseberries are in order. When you garden under the first sun of the season for hours, all you want is a ready-made lunch when you come back home. This is when soups, meat stews and stuffed vegetables come through. Everything that you can prepare in advance and which will gain flavour with time is your best choice when you know that you will come back home hungry. Either you are gardening, exercising at the gym, shopping at your local mall, watching your son’s soccer match under the rain or working extra hours in the office, prepare these stuffed artichokes and surprise yourself with a home cooked, ready-made lunch with an Italian flare. 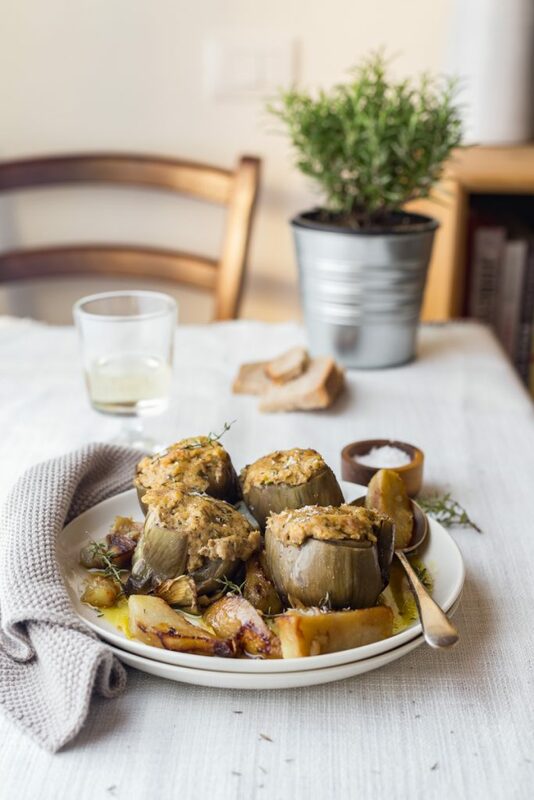 These are my grandma’s tuna and pecorino stuffed artichokes, round chubby vegetables with a soft tasty filling that are cooked with water and olive oil. The result is a deep green olive oil which makes the artichokes shimmer, and is also so tasty that you will finish your bread mopping the olive oil directly from the pan. And you will also lick your fingers. 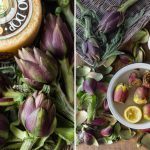 For the new article of the cooperation with the Consortium of Tuscan Pecorino PDO, I asked grandma how she prepares these artichokes, as she is always generous with pecorino when stuffing the artichokes. We talked about ingredients, stories, variations and memories and we agreed that garlic and parsley are necessary for the taste, tuna has to be of good quality, breadcrumbs are better when home-made, you can’t be stingy with olive oil and grated pecorino. Wedges of potatoes must be abundant, soft on the inside, golden and crisp on the outside. Artichokes will be steamed by the water in the pan and later fried by the olive oil: this will produce a tender heart and crisp deep green leaves which will disappear like crisps. Clean the artichokes by removing the stem and the tough outer leaves. Rub them with a halved lemon and plunge them in a bowl of water. Set aside and prepare the stuffing. In a bowl mix the drained tuna, the breadcrumbs, the chopped parsley, the beaten eggs and the grated pecorino. Season with salt and pepper. Gently open each artichoke with your hands and fill them up with the tuna filling. 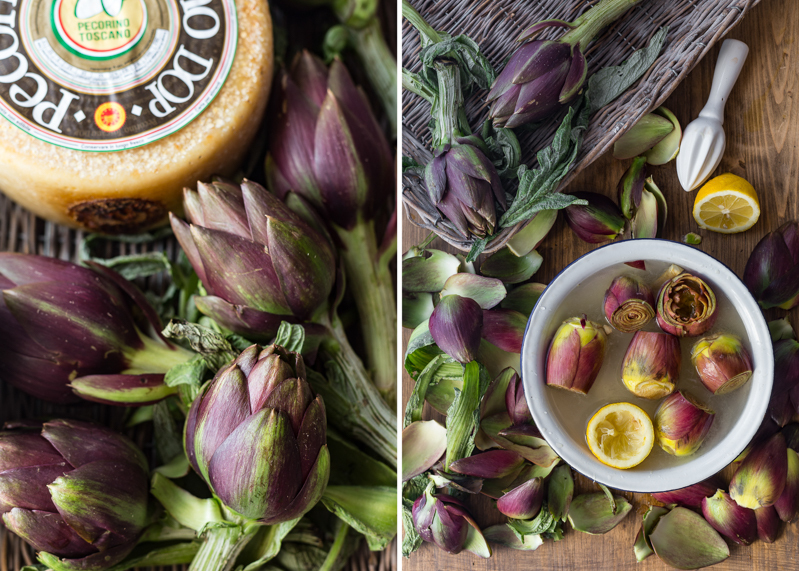 Arrange the artichokes in a deep pan with a flat bottom, large enough to contain them all. Peel the potatoes and cut them into wedges, then arrange them all around the artichokes so to prevent them from falling during the cooking. Season the potatoes with salt, then pour into the pan the extra virgin olive oil and the water. Cook the artichokes on medium-low heat, covered with a lid, for about an hour. The water, evaporating, will steam and cook the artichokes, and the remaining olive oil in the pan will brown them, turning the outer leaves into crispy chips. Golden soft potatoes are a bonus! You can serve the artichokes immediately or the next day: reheat them and they will be even more tasty. 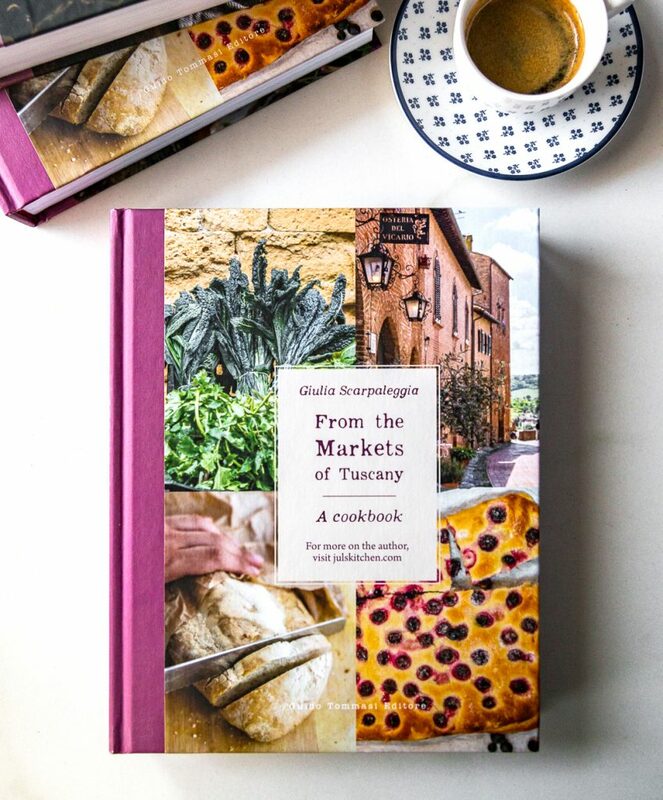 What have you been reading or cooking recently? Share links in the comments! 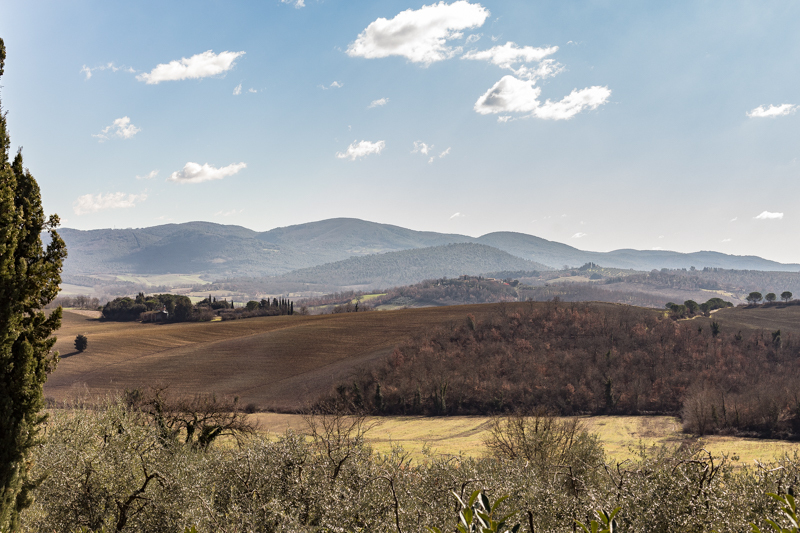 We are proud to work with the Consortium of the Aceto balsamico di Modena IGP. We’re developing new recipes for them and we’re also filming video recipes, which is super fun. This is our last video, crostoni with gorgonzola, pears and aceto balsamico. I’ve recently met a dear friend in Florence and we decided to chat over a traditional and honest dinner at Vini e vecchi sapori. Read Elizabeth Minchilli’s review on her blog, and get ready to book your table as the place is small. At the end of your meal, if you ask for a coffee, they won’t give you an espresso but a warming and homely coffee made in the old moka. The perfect seal to the meal. A new book in my bookshelf: The Cuban Table: A Celebration of Food, Flavors, and History, by Ana Sofia Pelaez and Ellen Silverman. The photos are stunning – I’ve been admiring and loving Ellen’s works since the beginning – and the recipes are honest and inviting. It is a beautiful book for some quality armchair travel. 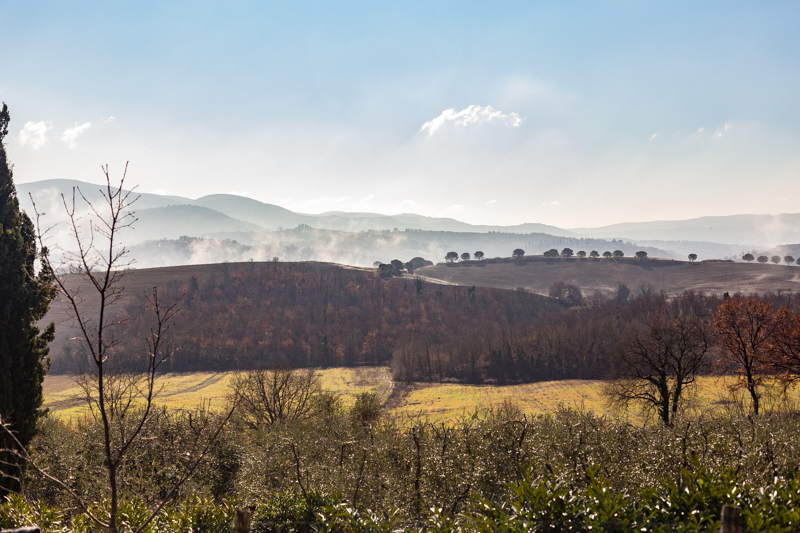 Scientists May Have Figured Out Why Olive Oil Is So Healthy. One more reason to be generous with olive oil as I’ve always been! A video you should watch, Claudia Roden live at SOAS. Take your time, sit on the couch and enjoy the lecture of one of the most important food writers of our times. I just watched a new episode of the third series of Chef’s Table, my absolute favourite documentary so far. This new episode about the chef Nancy Silverton and her obsession for baking moved me to tears. Quoting Mario Batali, her obsession is her mantra. She works so much on something. By repetition, a thousand and a thousand and a thousand times, over and over again. That level is very craftsmanship, not necessarily artistic. And that distinguishes her from a lot of fancy Michelin star chefs. Read more about it here. 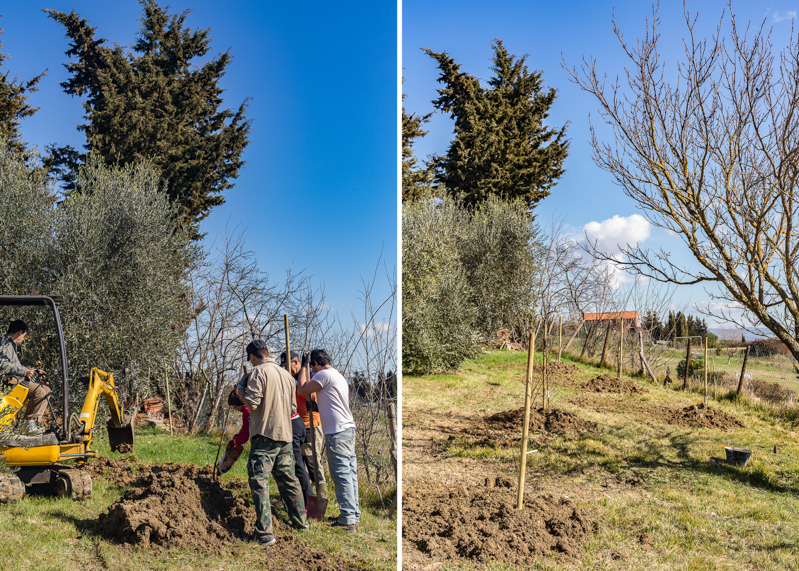 We are also planning to plant additional olive trees to supplement the 13 or so that already exist on the property. This fall our caretaker harvested our few trees and when we return next month we will be able to sample it. What a dream it will be to have our own olive oil, however scant. Funny, I have artichokes sitting on our counter. Must say I never thought of using them with tuna. I have another post on the blog about stuffed artichokes so you can refer to this for a bit more of a history about them. I have included the recipe here too though. 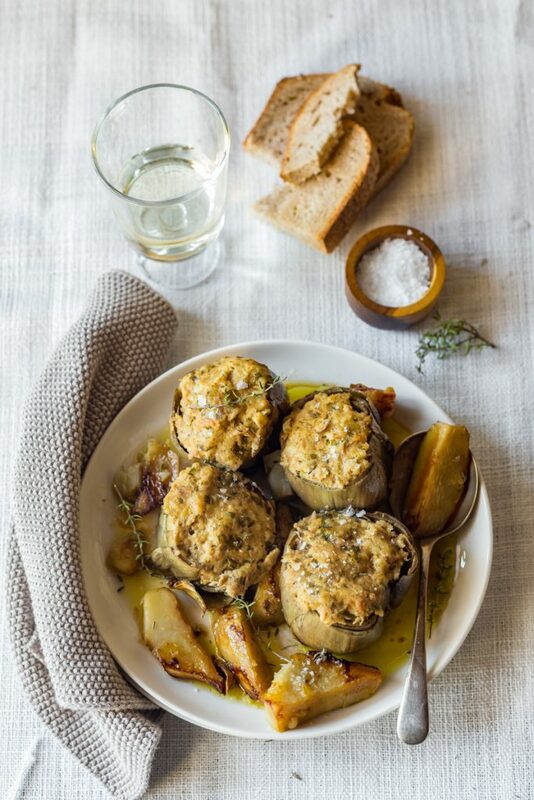 My family fill artichokes with a filling mainly consisting of parsley. Traditionally breadcrumbs are also used but we do not add them into our filling. You can add a few handfuls if you wish. next post: The season of agretti. Two monk’s beard recipes for you.